Scrapping Fancy: Welcome to Swirlydoos' July Kit Reveal Blog Hop Block Party!! Welcome to Swirlydoos' July Kit Reveal Blog Hop Block Party!! HELLO!!!! If you came here from the Swirlydoos blog, then you are on the right track. If not, go back and start from there. We have some amazing projects for you to see today !! So this is my take on the sketch. I was stunned by the beauty of it, that I wanted to follow it very closely, instead of just using it for inspiration. I started by adding faux stitching to the blue cardstock. I poked the holes with one of those old Cutter Bee piercing bugs, but I used a pen for the "thread". Then I used distress ink on the papers. The letters are Pink Paislee wood that I painted using Lindy's Starburst with a water pen. I added Kaisercraft blue pearls also. The green foliage are die cuts from Memory Box. What I am most pleased with about this layout is the layering of pics and flowers. I wasn't sure it was going to workout because of the thickness of the flowers, but it adds so much dimension! All of the flowers are from the flower add-on. 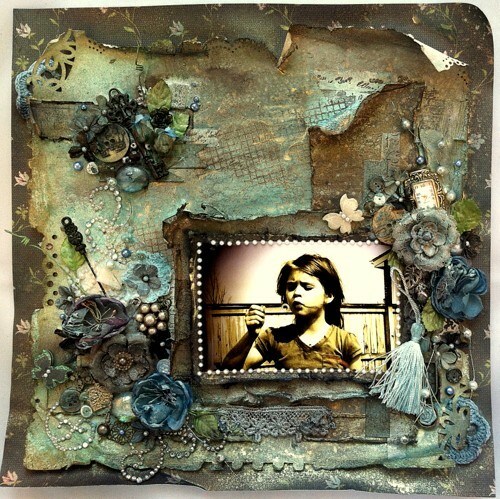 This is a layout inspired by the mixed media goddess, Anna Dabrowska. ( I love her so much that I am going to one of her classes in California in just a few weeks!) Whenever I see her gorgeous creations, I am always in awe and wonder to myself, "How the HELL did she do THAT?" So, I tried to see if I could maybe produce something similar. I like how it came out. 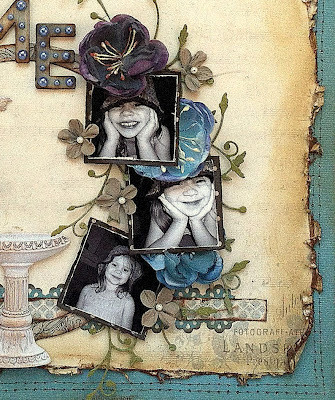 I distressed all layers with the Zutter Distrezz it All, and used various punches on the inner background paper, and stamped them using various Prima stamps from my stash. Then I picked out a BUNCH of embellishments to add using a gel medium. Mostly everything I piled on here is from the kit. I did use a few things from my own stash like buttons, lace, stick pin, and watch. After I added the embellishments, I used a few different Glimmer Mists. I then added the pic, pearls, and butterflies. Next month is my anniversary, and I felt like making a wedding mini album with a few of my favorite pics in sepia tone. This is just the cover that I have so far. The background is one of the Pion papers from the kit. I outlined it with Liquid Pearls in pewter and platinum, then added blue pearls to the edges in a few spots. I fussy cut the oval with roses and the "love birds". The bird bath has Picket Fence Distress Stain and Lindy's Starburst over that. All of the ribbon on the rings is from past Swirlydoos kits. I hope to finish the album in the next couple of weeks! This is one of my favorite pics of me and my daughter taken a few years ago. All layers were distressed using the Zutter Distrezz it All. The green/pink leaves are dies from Cheery Lynn. I used the same technique of faux stitching that I used on the "ME" layout on the title circle. The beautiful pink flourishes and photo border are Flourish with a Bling (Bella Rhinestone Flourishes in wine). I hope you enjoyed having a look at my projects! 3: Finally, go back to the Swirlydoos blog and leave a comment letting us know how much fun you had, tell us the QUESTION that was created with all of the special words you collected, and THEN ANSWER it!! Can't wait to hear from you. The party continues over at the fabulous Paulien's blog. Have fun! Beautiful pages. I especially love the first one. The colours in this month's kit are beautiful! 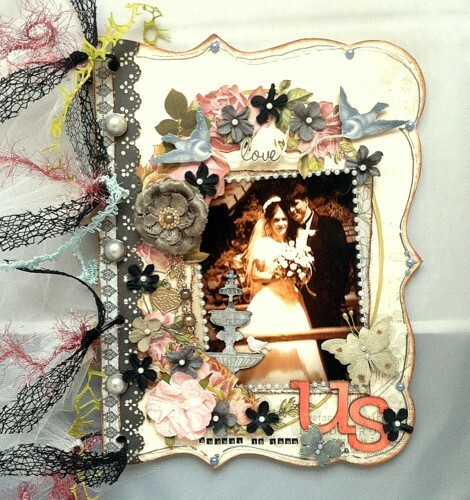 Your photos are beautiful and love the details on your layouts. 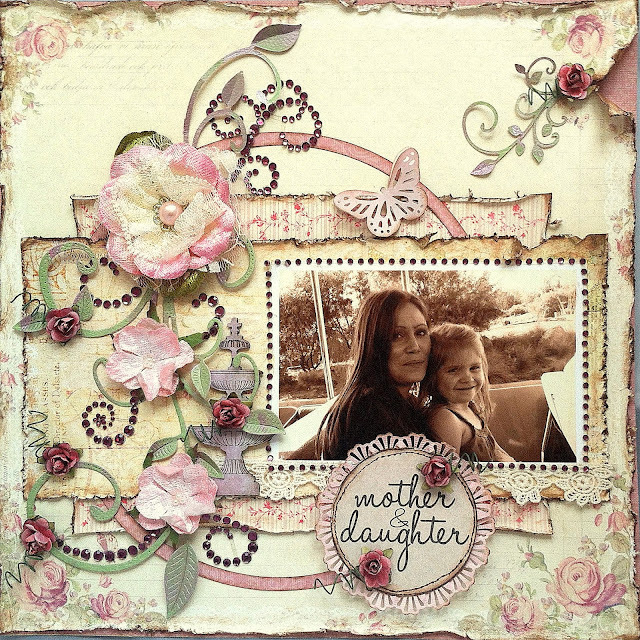 Love your Mother and Daughter layout! How sweet mad feminie! Gorgeous projects!! I love them all! Lovely layouts and projects. I can hardly wait to receive my kit. Stunning work, Rae! Just love what you have done with this kit! Thanks for the inspiration. Beautiful work, but that untitled blue layout is wonderful. Love all the different textures! Great projects. I can't pick a favorite as they are all fab. Gorgeous LO's, Rae! Love the colors in this kit! Can't wait for mine to get here! Rae... you have outdone yourself this month. AMAZING projects!!! So Beautiful and rich in details. Your layouts are absolutely gorgeous! I love the "ME" layout!! Your work is truly stunning. My new favorite reveal from you - incredible work! Amazing and beautiful layouts! Love them all! Love what you've done with this kit, Rae. I was wondering how well the papers would lend themselves to more masculine layouts, but I no longer have any worries after seeing how beautifully you've grunged up your first two layouts! This kit looks amazing and I really loved all of your projects. I particularly liked the layout with the picture of you and your daughter. I think the picture fit perfectly with the the colors of the kit and all the embellishments you used. It was just beautiful and touching. . . Being a real fan of mini albums, I love the first page of yours. I can't wait to see the rest of yours. Your layouts are lovely, too. Rae, "Me" page is simply delicious. Beautiful work with this month's kit. Gorgeous projects Rae! I love the variety of inspiration you gave this reveal! All gorgeous - of course! Really love the "Me" page and your take on Anna's style! Really love how your take on the sketch turned out. Oh wow, I absolutely love your work with this kit! Wow Rae your layouts and mini album are fabulous and I am in love with your untitled layout! 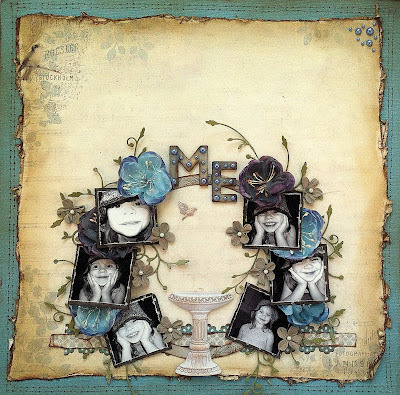 I'm going to have to try something like this as I always love how Anna Dabrowska does these type of layouts - how lucky you get to go to one of her classes! Rae your work is amazing. Love what you did with the mixed media. GORGEOUS. Have fun at Anna's class. Wow I love your work!!! I will be following you from now on. I love blog hops so I can find people I would have never known of otherwise. thanks for sharing. Also I have the Zutter Distress tool and never use, well I will now!!!! have a great week! Everyone of your layouts are stunning, but I especially like the blue one. It has such a rich vintage look. Gorgeous projects. I love them all!!! Your pages are really beautiful. I'm not a scrapbooker but I can certainly appreciate all the beautiful pages everyone does, TFS. This new kit might just convert me. Love the Mother and Daughter layout! Rae - absolutely stunning! I particularly like "me" and the "mother & daughter" layouts. Just gorgeous!!! I like all of your layouts but I think Untitled is my favorite. I hope someday I allowe myself the freedom to make a page like that!! Your layouts and album are amazing! Wow, your layouts are stunning! You did a fabulous job :D I'm a new follower!! Beautiful kit, beautiful colors, beautiful layouts. The first two are blue, but 100% girly. I love them. What a beautifull lay-outs! They are amazing!! I became a follower of this blog. Rae.......speechless......esp over the "untitled" page!! Two Thumbs Up!!! I really like the rustic look of your layouts. So much texture and details. Well done. Beautiful lo. I love what you did with the mother and daughter lo. The colors are so soft and beautiful. I love your work! You are so very talented, I look forward to keeping my eye on it! Beautiful layouts! So many textures and layers....love it! I love your Mother daughter LO. You are both so cute!!! Love these LO's! Beautiful work with all the textures and colors. Your pages are amazing - thank you so much! Wow!!! Your layouts are stunning! Rae, your pages are amazing this month!! I totally love you Anna style one!!! Ohhh, these layouts are just amazing. Love the mixture of blues, pinks and the grungy one. Soooo pretty. What depth of detail and care ! Love what you made! Beautiful work Rae. I am enjoying my recent discovery of your work. It is awesome. WOW!!! Stunning pages!!! I love the way you laid out the photos in that first page! Exquisite work Rae!!!! Your pages turned out gorgeous!!! I know you are so looking forward to Anna's class!! Lucky!!!! Wow, such a beautiful job! I am so happy that I came across your page! Beautiful work! I love the layering and colors! TFS! What an amazing and inspiring Blog...You create such beautiful LO!! Wow, you are unbelievably talented! I am in love with every one of your layouts! so lovely LO.... wish i have all the materials too! Fantastic work Rae! Love the mixed media inspired page and the mother-daughter page! Really beautiful layouts. I love them all. Love the colours and wht you have created! Your layers ans detail are amazing to look at. Very inspiring!! I love LO inspired by Anna, colors are great! WOW!!! These LO's are amazing!!! I love that little mini album page, but all are beautiful! Amazing! Beautiful pages. Love your last page. Wow !! Those layouts are amazing, your mixed media (Untitiled) blew me away, love the colors, love all the textures and the DETAILS!!! Wonderful Layouts! Your pages are so sweet! Your layouts are amazing! So beautiful! You have such a delightful creative style! Love that photo of you and your daughter! Thanks so much for sharing with us! Wow, that kit looks awesome. Great job! Your layouts are amazing! Love your work.